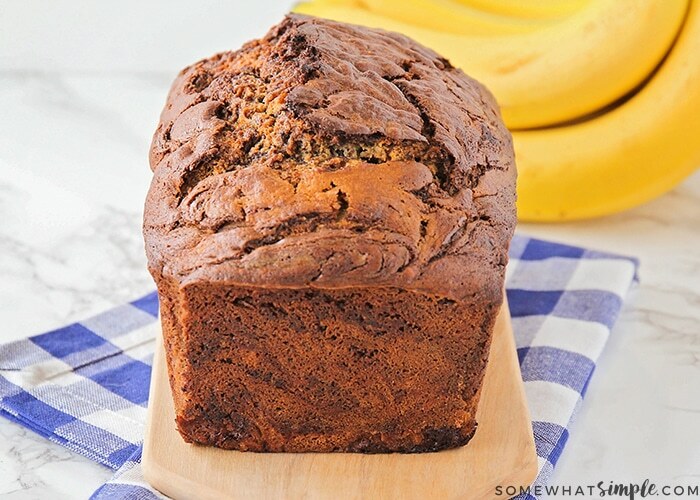 Take banana bread to the next level with this easy chocolate banana bread recipe. 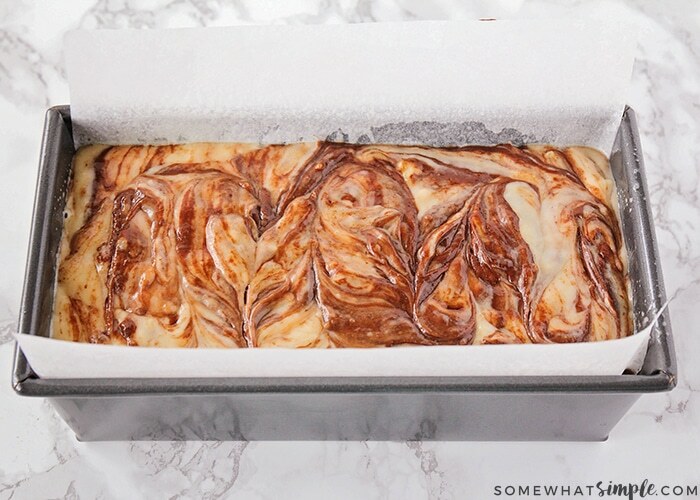 Swirl in some melted chocolate that will deepen the flavor and add a beautiful marbled color to the loaf! Banana bread is one of those treats that is perfect at any time of the year – do bananas ever go out of season? 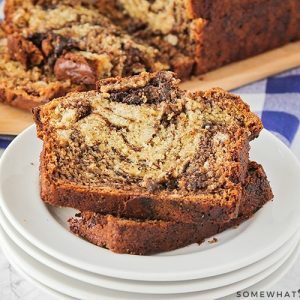 This chocolate banana bread is a beautiful sweet bread that is so easy to make, and it’s amazingly delicious! 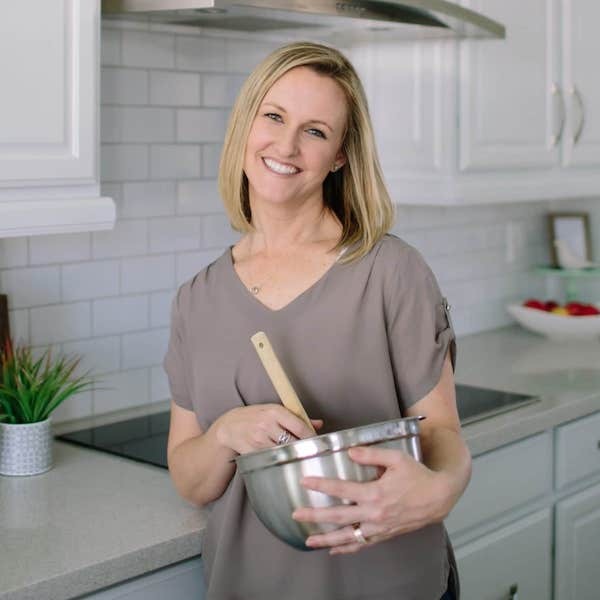 Making chocolate banana bread is as easy as it gets! You’ll need a few very ripe and soft bananas, plus a few staple items from your pantry and fridge. You simply mix the ingredients, pour it into a greased loaf pan, and bake it. Nothing hard, nothing scary! 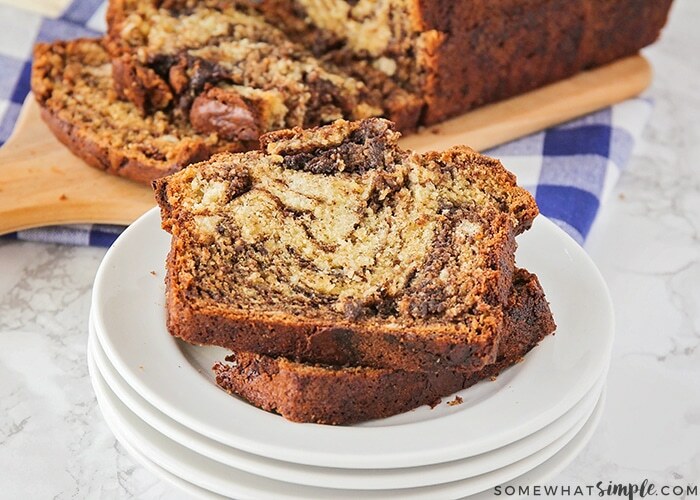 To make the pretty chocolate swirls in this chocolate banana bread, just melt some semi-sweet chocolate chips, add a teeny bit of oil so it will be easier to pour, then add the chocolate into the banana bread batter and gently fold and swirl it around. 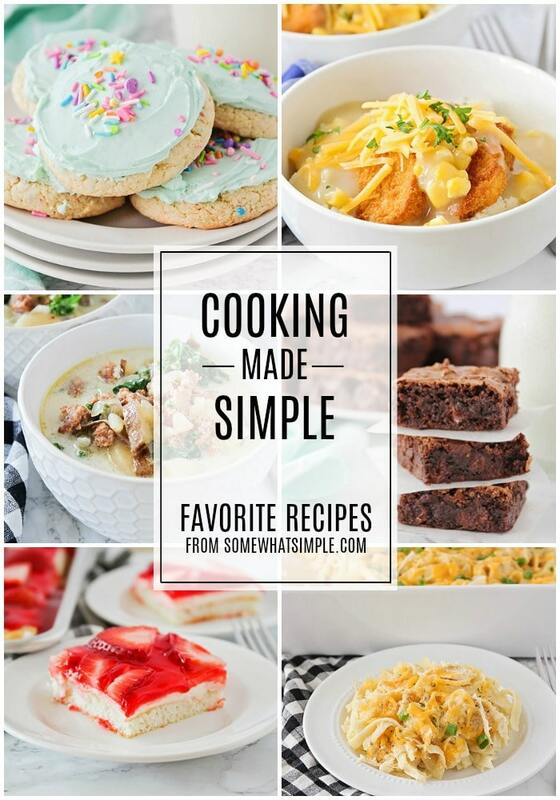 Here are the easy steps you need to follow to make this easy recipe. Mash the bananas in a mixing bowl and then mix with the baking soda and baking powder. This will cause the bananas to become a little frothy. In a separate bowl, mix together the sugar and your preference of oil or butter. 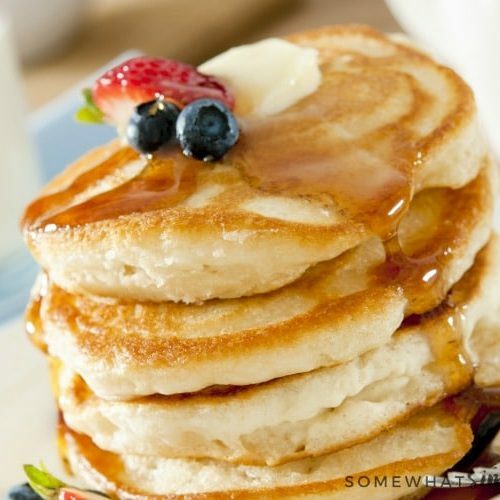 I have always used oil for this recipe and it’s turned out perfectly every time. Mix in one egg at a time with the sugar and oil mixture. Add the mixture of frothy bananas and mix everything together well. 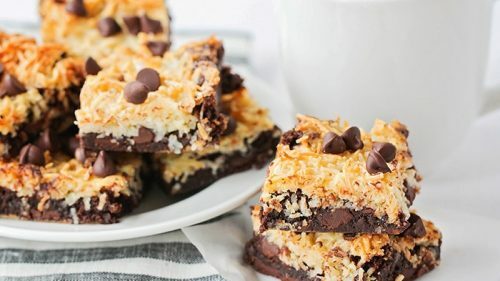 Pour the melted chocolate over the top of the batter and then gently fold the chocolate with the batter to create the beautiful marbled look. 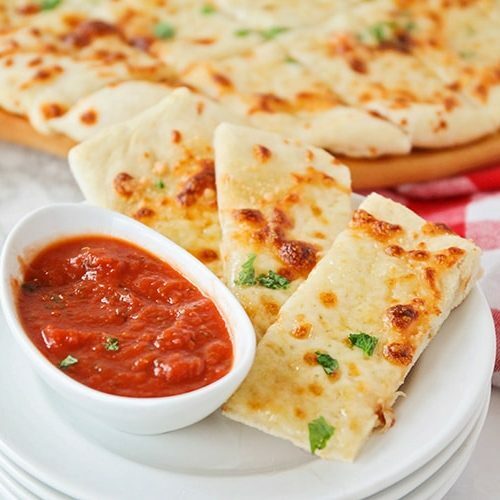 Grease and flour your bread pans. Pour in the batter and then cook at 350 degrees F for about 40-60 minutes. 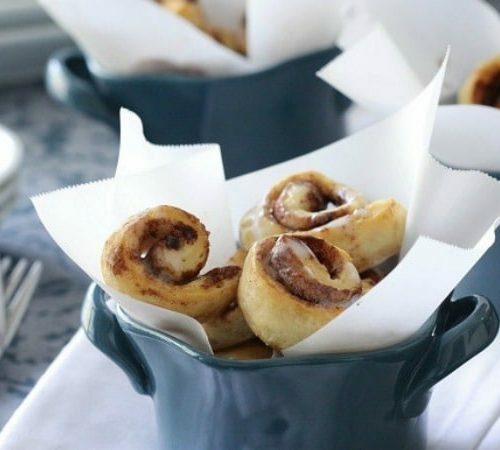 If you’re using smaller bread pans, they only need to be baked for about 30 minutes. Remember, each oven is a little different so the baking times will vary. 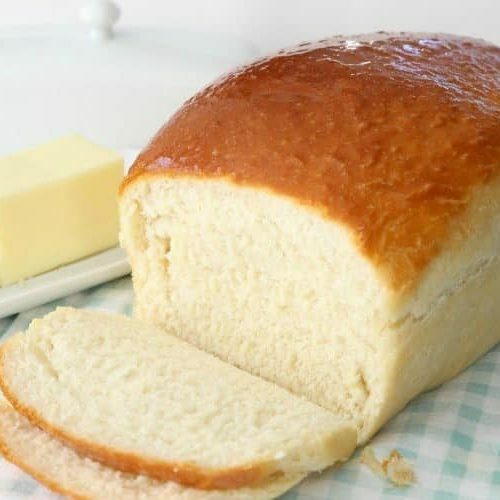 With about 10 minutes left to bake, insert a toothpick into the center of the loaf to see how the loaf is baking. When the toothpick comes out clean, the loaf is done. The top of the loaf should be a nice golden brown. (see the picture below) If your loaf turns out dry, you cooked it for too long. Chocolate banana bread will stay fresh for about 4 to 5 days if you keep it wrapped and in the refrigerator. Assuming my kids don’t devour it when I pull it out of the oven, I usually just put each loaf in a freezer bag to keep it fresh. You can definitely freeze this chocolate banana bread recipe. Once the loaves have fully cooked, place them into freezer bags for storage. You can keep these loaves frozen for about 3 months. When you’re ready to use them, just place them in the refrigerator overnight to thaw. Chocolate banana bread is the perfect “welcome to the neighborhood” gift and can be used for so many other things. A special treat for your child’s favorite teacher, a reward for a goal met in a church class, or something fun to bring in to work to share with everyone. 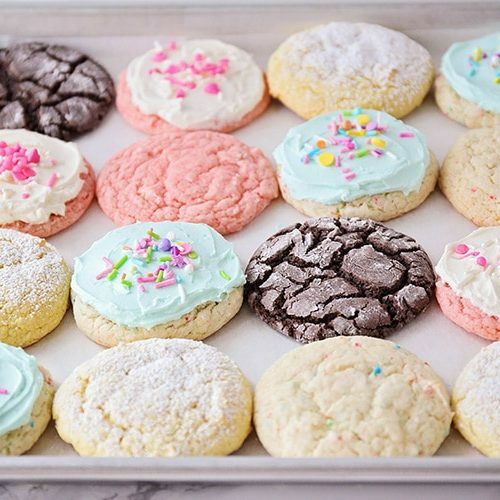 Leave me a comment below and let me know how it turned out, if you tried any delicious variations or if you used it as gift to brighten someone’s day. 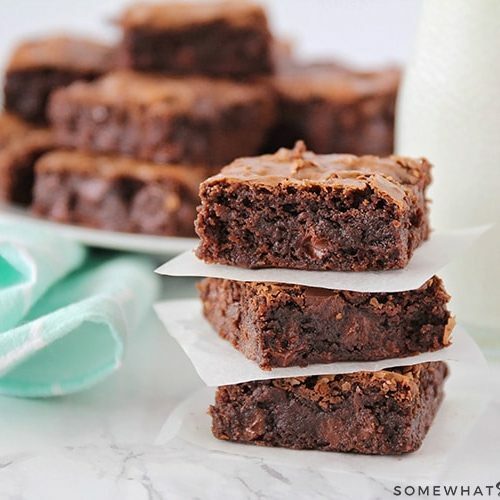 Take our favorite banana bread recipe to the next level by swirling in some melted chocolate! 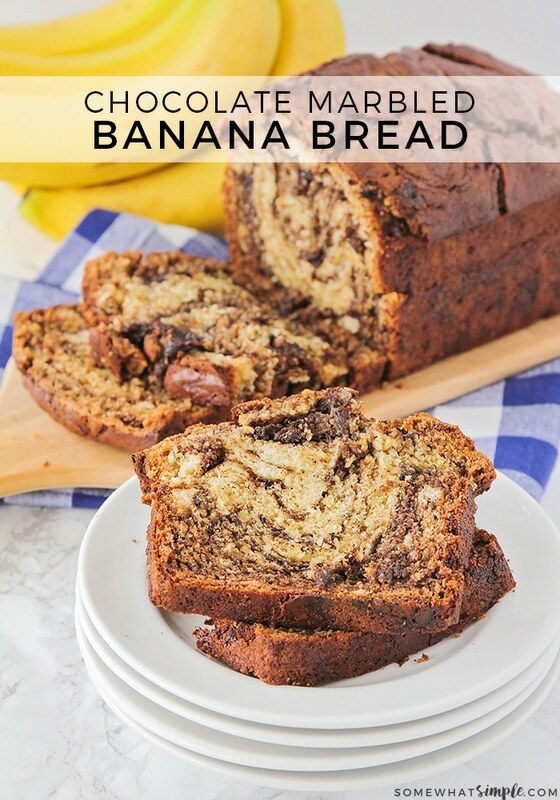 It deepens the flavor and adds something special, while also making the chocolate banana bread look so pretty! Add baking soda and baking powder to mashed bananas and stir. The bananas will become frothy. Mix sugar and butter or oil in a separate bowl. (I always use oil and the bread turns out perfectly). Sift flour and salt together and add alternately with the 1/2 cup of water. (Add a little of the flour, then a little of the water, and repeat until each is used up). Add the frothy bananas and mix well. 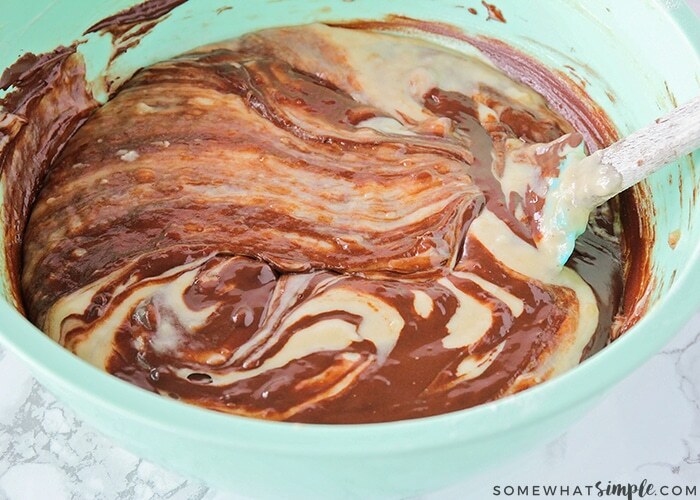 Pour the melted chocolate over the top of the batter and gently fold and swirl it into the batter. Grease and flour a large (9x5) bread pan, or 4-5 small bread pans. Pour the batter into pan(s) and bake at 350 degrees for 40-60 minutes for a large loaf, or about 30 minutes for the small loaves. After the minimum amount of time, insert a toothpick to see if it comes out clean. If not, cook for longer. The top crust should be nice and golden brown. This was a hit! The kids walked in from school with some friends and the 2 loaves were gone in minutes! haha! Thanks! I love banana bread! Can’t wait to make this! Banana bread is our favorite and the chocolate just takes it over the top! 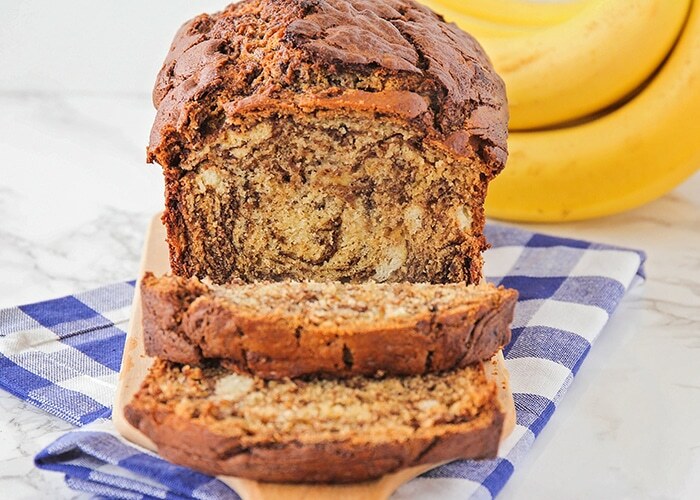 So delicious- we love this banana bread recipe! YUM!! Chocolate & banana is the best combination! There is nothing like the smell of homemade bread in the oven!